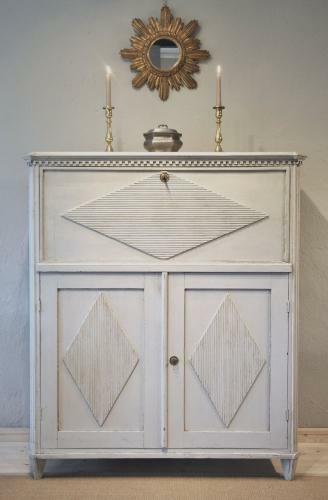 This standing secretaire, Sweden ca 1820, is a real statement piece and features all the hallmarks of the Gustavian style, from the rombus shaped reeded carvings to the carved frieze. We found this in Stockholm. It is also highly versatile, and can be used in an entry, as a stylish house bar, in a library or even a a TV trunk. The paint has been refreshed in a lovely creamy off-white with hints of grey. Locks probably not original, but working, keys enclosed and brass hardware appears good quality and period. Shipping to London or Home Counties: £ 200, Germany € 80.